Rancho Cacachilas spans 14,000 hectares in the Greater La Paz region of eastern Baja California Sur, Mexico. It is comprised of private historic working ranches, an adventure resort, and wilderness camps in a setting of 60 kilometers of world-class Baja mountain biking, hiking and running trails. Experience a unique and extraordinary eco-adventure vacation! The ranch complex is a private, gated, and off-grid operating self-sufficiently on solar power without reliance on public utility services. Our ranches and camps are bound together by our comprehensive land management plan that protects and rejuvenates the land, from mountains to sea. We’d love to show you how! There are three separate and quite different lodging options for your eco-adventure getaway at Rancho Cacachilas: the adventure resort and camp with Wifi and electricity powered by solar, the remote wilderness camp high up in the Sierra Cacachilas with wall-cabin tents and solar power, and the historical mining camp with an outdoor kitchen and tent camping area. All ranches and camps have eco-designed composting dry toilets and bucket showers, with solar-generated hot water. This is our primary overnight location at Rancho Cacachilas. The resort includes a large comfortable community room with wifi, a fireplace and small library, a large multi-purpose palapa (circular meeting room, great for events), an indoor and outdoor kitchen, as well as a small swimming pool overlooking the Sea of Cortez. Sleeping options at Chivato include cabin tents, bunk rooms, and regular resort rooms. Direct access to the trail system at Chivato. Minimum 2 night stay. Most adventure tours are based out of Chivato. This is a remote group camp with wall-cabin tents spread out along the mountain ridge lines, with 2 centralized camp kitchens. Solar powered, off the grid and no WIFI—you’ll love this! 360 degree views of Baja California Sur’s mountains and the Sea of Cortez. The dark night star-filled skies alone make this camp a favorite with guests. Direct access to the trail system at Los Pisos. Minimum of 2 nights and 6 guests. Enjoy hiking and birdwatching here. Set in a deep canyon near historic mining ruins, Las Canoas whispers the stories of 300 years of miners, families, and long-ago towns. It’s at the center of the world-class mountain biking trails at Rancho Cacachilas. Outdoor kitchen and day use picnic area. No wifi. Solar-powered electricity. Hiking, biking, and bird watching can be enjoyed here. These working ranches are historical and still as active as ever; they are where you have the opportunity to experience a variety of different agricultural and physical activities. There is no lodging available at our working ranches; they are strictly your destination for getting an inside look into the processes that sustain the Rancho Cacachilas ecosystem. Where award-winning artisan cheeses are hand-crafted, and guests are delighted with cheese and wine-tasting gourmet lunches. You also have the opportunity to visit our local organic seed garden, along with its resident goats, chickens, and cows. A must-stop on a day or multi-day Rancho Cacachilas experience. The cowboy center of Rancho Cacachilas! All mule riding trips base out of Gaspareño. It’s also home to the Farm-to-Table sustainability workshops and the largest organic gardens of the ranch complex. Livestock management for the Rancho Cacachilas cattle herd is based here as well. 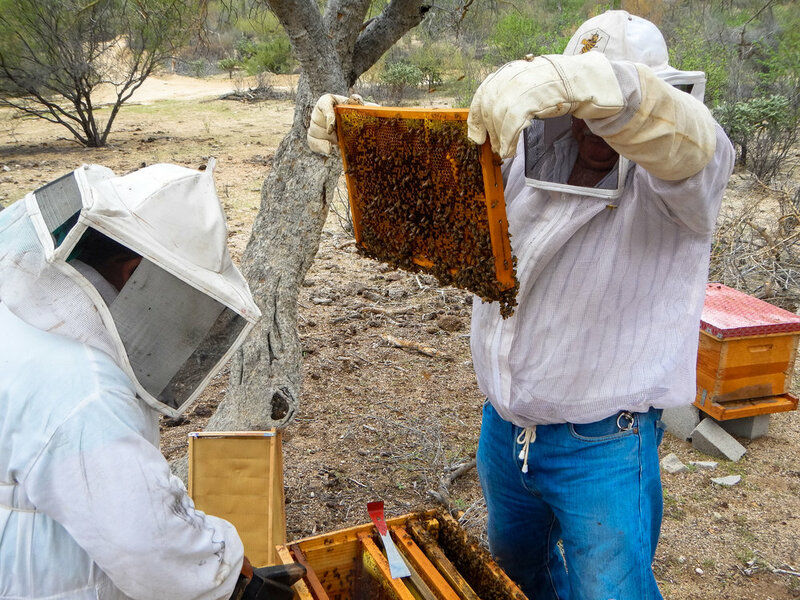 This working ranch is located on the plains at Ventana Bay and houses the beekeeping and honey production operations. You can tour San Martin on your day or multi-day visit to Rancho Cacachilas. It’s also an amazing birdwatching location. Rancho Cacachilas is a private working ranch with resort & wilderness camps across its complex of over 14,000 hectares of rugged mountains and valleys of the Baja California Sur peninsula. Get around the complex by Ranch shuttles, biking, or hiking.